The Gray Report: Rombauer Chardonnay makes surprise TV appearance on "Chuck"
Rombauer Chardonnay makes surprise TV appearance on "Chuck"
Rombauer Chardonnay, swigged out of the bottle, apparently boosts computer hackers' proficiency. That's what we learned from watching the NBC show "Chuck" last week. It looked like a product placement -- the label was prominently displayed, and the brand was named in the script. But I called Rombauer on Monday and it turns out they were as surprised to see star Zachary Levi drinking their product from the bottle as I was. "I missed that episode, but a whole bunch of people called to tell me about it," said John Egan from Rombauer's sales and marketing department. "It's flattering as all get-out, but we did not know ahead of time that they were going to do it." 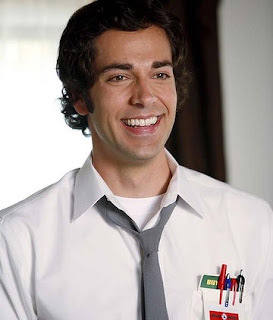 A little background on "Chuck": It's a spy action-comedy that was nearly canceled after two seasons because of poor ratings that have never improved, but it was saved by an Internet campaign spearheaded by my favorite TV critic, Alan Sepinwall. One of the things fans accepted about later seasons of the show is that it has more open product placements than usual, mostly for its main sponsor, Subway. The original Internet campaign to save "Chuck" focused on fans eating at Subway; subsquently, every other episode, one of the characters eats a Subway sandwich and comments on its deliciousness. I am one of the small group of "Chuck" fans, thanks to Sepinwall, and was well aware of its product placement history, so it was shocking to learn that the show's producers hadn't managed to get more money from the winery to help produce the episode (which had a guest appearance by Danny Pudi from another low-rated critical favorite, "Community."). In the episode, Chuck -- a onetime nerd who over five seasons has morphed into a successful spy -- needs to return to his roots to do some heavy-duty hacking. His best friend Morgan tells his wife that whenever Chuck used to code, he always drank Rombauer Chardonnay heavily, and that she should watch him to monitor his intake. He swigs from the bottle repeatedly, laughs loudly, and gets the job done. The thing about Rombauer Chardonnay is, it's meant to be rich and buttery and oaky -- it's unabashedly over the top. It's not a food wine anyway, and I can totally see swigging it from the bottle. Why not? Maybe Rombauer should market itself as "the wine for hacking sessions," or "the Chardonnay for when glassware is unnecessary." I asked Egan, and he said that the marketing department is still talking about it. He said they had talked about posting some footage from the show online, "but we wouldn't want to step on the toes of NBC." My take: Go ahead, step on those toes. As bad as NBC's ratings are, the network could use some of Rombauer's legions of fans -- though given that "Chuck" seems to appeal mostly to sci-fi geeks (current guest star: Carrie-Ann Moss, best known from "The Matrix") and Rombauer to older middle Americans, they may speak in different tongues. But who doesn't like sharing a bottle of wine? That said, I prefer to do so with a pair of glasses, thanks. There was also a bottle of Hundred Acre cab on Parks and Recreation earlier this year. We noticed it pretty quickly, too, and were quite amused. Kind of fun when you consider that Zach Levi likes wine, but isn't all into it. This is the interview we did with him over a year ago for Tangled. I think it would be interesting to check back with Rombauer winery after a week or so, to see if their sales spiked. My husband bought me a bottle of Rombauer the night after the episode aired. The show may be ending but the writers are brilliant and hopefully will go on to other shows. Yes, we bought Subway faithfully during the campaign to save the show. A nice chardonnay is so much better. If you're going to have the Chard with a Subway sandwich -- since you're clearly a true Chuck fan -- I'd go for either turkey or tuna salad, and leave off the pickles and peppers.